Here is my TUSAL, still full of flower thread from The Shelburne Sampler. This sampler has taken way longer than I ever believed it would, but now, the end is finally in sight. I have to finish one little tree, stitch 4 crowns, finish the border, and do the initials. Wow! Maybe the end isn't all that close after all! Some projects just seem to take longer than others. Hope everyone has a great time this weekend. It won't be such a fun one for us. We will be travelling to go to a memorial service. Not looking forward to the holiday traffic, but what can you do? Will post just as soon as I finish this one. Soon I hope! 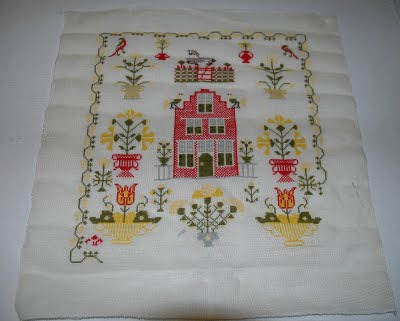 Your Shelburne Sampler is gorgeous! I just love the colors! Good luck with traffic. Another TUSAL and a finish!